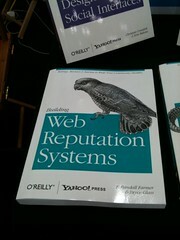 ...The book concludes with a real-life case study based on Yahoo! Answers Community Content Moderation. This makes interesting reading and gives a context for what has gone before. It left me wondering whether I might have got more from the rest of the book had I read it first - but of course with this type of book you wont just read once and set aside. You'll refer to it for help as the need arises - and there is an index that will help you locate specific information. At the end of the day I realised I'd gleaned a lot of useful and practical advice but it would have been an easier experience with just a little reorganisation of the material. "...Book is light read but certainly deserve an attentive read and particularly from product designers and who ever involved in product conceptualization..."
Please forgive us if the Reputation Wednesday posts for a few weeks are focused on book-release related information. We're first time authors and find every one of these personal firsts terribly exciting! 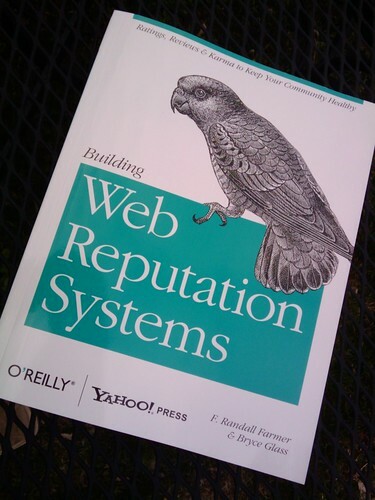 The electronic versions of Building Web Reputation Systems are now for sale at O'Reilly.com! You can read it on Safari and/or you can by a downloadable version as a color PDF, Mobi, Android, or ePub file These versions are great on your computer and can be read on most mobile devices.All of the electronic versions have both the internal references and the web URLs hot-linked, which is great for a book like ours. There's also a bundle combining the print and ebook editions at a significant savings. Search the digital version to find correct section in the physical book. Save $20.00! Update:eBooks version now includes Android format. We're proud to announce that Chapter 10: Application Integration, Testing & Tuning is now drafted and ready for those of you hearty enough to consume raw, unedited content..
We're starting to come into the home stretch with only two chapters remaining unwritten and the formal review process ramping up. It's getting pretty exciting. We've been busy boys over here on BuildingReputation.com, though—unless you were paying careful attention—you might not have noticed. We've fallen victim to something that strikes all authors (we suspect) and have been so busy drafting, outlining, writing & revising that we've had a hard time keeping up with this site, and promoting the ongoing progress on the book. In the first draft of chapter 6 of our book on reputation system design we begin guiding the reader through a process to create their own reputation model. We start by helping identify the business and other goals they have for their application/site, and quickly move on to what kind control model they have in mind for users creating and interacting with content: What we're calling Content Control Patterns. These patterns have general applicability when talking about all social media design, so we wanted to share them widely and gather feedback as early as possible. We'd especially like suggestions for better names for the patterns. The individual CCPs (Content Control Patterns) are detailed over on the wiki, so be sure to click through on one of the pattern names or images. Whether you need reputation at all, and the particular models that will serve you best, are largely a function of how content is generated and managed on your site. Consider the workflow and life-cycle of content that you have planned for your community, and the various actors that will influence that workflow. Who will draft the content? Will anyone edit it, or otherwise determine its readiness for publishing? Who is responsible for actually publishing it to your site? Can anyone edit content that's live? Can live content be evaluated in some way? Who will do that? What effect does evaluation have on content? Promote or demote its prominence? Remove it altogether from the site? Who will create the content on your site? Users or staff? Who will evaluate the content? Who has responsibility for removing content that is inappropriate? There are eight different content control patterns for each unique combination of answering the questions above. Each pattern has unique characteristics when considering what reputation systems you may, or may not, wish to consider for your application. For convenience, we've given each pattern a name: Web 1.0, Submit-Publish, Bug Report, Reviews, Surveys, Agents, Basic Social Media, The Full Monty, but these names are just place holders for discussion, they are not a suggestion to recategorize your product marketing. We will now cover each of these content control patterns in detail so you will understand the implications and ramifications of each. The Content Control Patterns for communities of content. These largely determine the amount, and types, of reputation models that you will need. If you have multiple content control patterns, consider them all and focus on any shared reputation opportunities. For example, you may have a community site with a hierarchy of categories that are created, evaluated and removed by staff, but perhaps the content within that hierarchy is created by users. In that case, two patterns apply: the staff-tended category tree is an example of the Web 1.0 content control pattern and as such it can effectively be ignored when selecting your reputation models. Focus instead on the options suggested by the Submit-Publish pattern formed by the users populating the tree. Once you, the reader (and um, we the authors—we're still at least partially figuring this out ourselves!) become conversant in the concepts and the language prescribed, we'll use this language throughout the rest of the book to build ever-more involved reputation models and illustrate some well-known case studies such as Digg-style vote-to-promote systems, or some effective abuse mitigation systems that we've worked on during our time at Yahoo! So, please do review Chapter 2: A Grammar for Reputation and share your thoughts, either as comments on the wiki or here on the blog. This chapter is something unlike what we've published here so far, and we hope that it's an important milestone in thinking about—and talking about—reputation in a systemic and structured way. Up to now, if you'd visited any of the not-yet-drafted Chapter pages over on the wiki, you would've seen... well, nothing! It occurred to Randy and me that this was probably not the best way to solicit public comment. This is particularly problematic because it's exactly at this stage—before we've drafted a chapter—when comments and direction are most valuable. So today Randy migrated most of the content over from the proposal that we presented to Yahoo! and O'Reilly for the book, so each incomplete chapter now features a SUMMARY direct from our book proposal. These summaries are sketchy outlines for the chapters contents that hopefully call out concepts that we're anticipating. 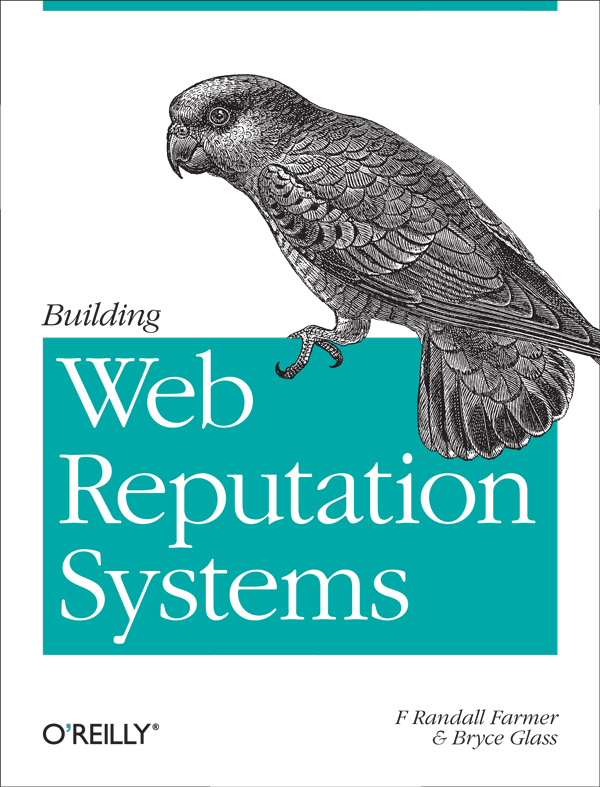 Hello, and welcome to our brand-new blog, which is a companion site to our in-progress book: Building Web 2.0 Reputation Systems. "We," in this case are F. Randall (Randy) Farmer and Bryce Glass. (Of course, we'll introduce ourselves in a little more detail soon.) The book will be a Yahoo! Press release, published by O'Reilly Media. As the name would suggest, Building will be all about the design considerations (technical-, community- and user-experience-related) of deploying reputation systems for social media sites. It's a topic that we feel passionately about (and one that's timely) and our hope is that this blog—and an accompanying wiki—will afford you, our gentle reader, the opportunity to engage in this process with us. Our editors at O'Reilly have basically given us carte blanche to share material from the book well in advance of publication, in whatever format we see fit. We anticipate that this may be a messy process (at least at first) and possibly not suitable for the faint-of-heart. Some of you may ask "How open could you possibly be? Why would I buy the book if all the material is out there on the Web?" Our answer to this is simple: with this site and the accompanying wiki, we're making an earnest attempt to embody the principles of the Unbook philosophy. By becoming part of this community and participating in any fashion (comments are welcome, edits to wiki pages even better!) you should be prepared to see the sausage being made. In fact, we hope you add a liberal dash of your own spice! At some point (Fall of 2009, God-willing!) all of this effort will yield a tangible, physical, and nicely-formatted benefit: a hearty meal that anyone can sit down and enjoy.